Warmist Graham Readfearn of The Guardian has a piece today titled, "What really annoys scientists about the state of the climate change debate?," in which he interviews the usual alarmist suspects such as Michael Mann and Stefan Rahmstorf about "what is it that really gets them annoyed?" "model projections have underestimated the rate and magnitude of the climate changes resulting from our burning of fossil fuels"
such as the zero global warming over the past 18 years. He's also most pissed off that "Rather than being cause for inaction, uncertainty is a reason to act all the sooner." "One of the phrases that makes me cringe is when I read in the media that a particular extreme weather event "is no evidence for climate change". This is so bad it's not even wrong, but it is quite misleading." Notes for Rahmstorf: Even the IPCC SREX says a particular extreme weather event is not evidence for climate change, and there is no evidence that climate has become more variable or extreme. "I want some of our decision-makers and commentators to either shut up, or familiarise themselves with climate science well enough to talk sense." apparently unfamiliar with the concepts of free speech, scientific or political debate. "humankind is encountering the finitude of our planet"
i.e. the end of the planet is near and we're not doing enough. I can buy disaffected scientists to deny sound science with a plane fare to a bogus conference and a little publicity. Andrew Glickson is most upset about "irreversible tipping points," which have never occurred in Earth's 3.5 billion year history with CO2 levels 17-25 times higher than the present. "Dismissing the link between climate change and extremes as hogwash leaves us vulnerable to a warmer climate." while ignoring that there is no evidence that climate has become more variable or extreme, paleoclimate evidence shows extreme weather is more common during cold periods, and many climate models predict less extreme weather in a warmer climate. Illuminating that these scientists are most upset about politics and one-sided scientific arguments with scant scientific evidence to back them up, and for which ample conflicting evidence exists. 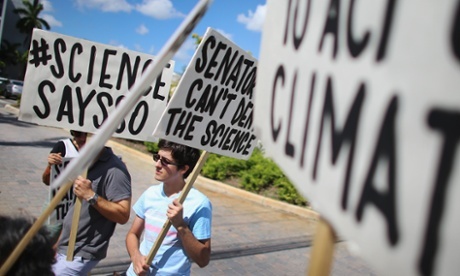 Protesters at the office of a US senator who doubts the evidence of human-caused climate change. “Don’t shoot the messenger,” so the saying goes. But what if that message warns we might want to rethink that whole fossil fuel burning thing pretty quick because it could seriously alter civilization and the natural world for centuries to come, and not in a good way? Time to get the bullets out and start firing, obviously. Climate scientists have been trying to dodge, catch or deflect those bullets for decades. They are now all too used to being shot at, kicked and maligned as their findings are misunderstood, misrepresented, trivialised or booted around like footballs between politicians and other warring ideological factions and self-interested industry groups. But if they had to pick one thing, what is it that really gets them annoyed? When the public tries to understand the implications of their scientific findings – or just understand the findings themselves – what’s the most common mistake they see? When the media gets hold of their findings, what makes climate scientists chuck a shoe, ice core or physics textbook at the screen in frustration? I decided to ask a few leading climate scientists from around the globe to articulate that one thing that leaves them totally tacked off. Some struggled to pick only a single bugbear (one even called to apologise for taking too long, so spoilt for choice were they), others took the chance to uncompromisingly unload their frustrations. Many people who would not dream to claim they understand how antibiotics, microprocessors or immunisations work seem happy to wax lyrical on their views on climate change. A politician or media identity who would be laughed out of office if they said “vaccines don't work" or “I am certain the moon is made of cheese" happily speak equivalent rubbish on climate science, believing their views deserve credit. I want engineers to build bridges; I want a trained surgeon to operate on hearts and I want some of our decision-makers and commentators to either shut up, or familiarise themselves with climate science well enough to talk sense. If there’s one concept that is typically misrepresented in the public discourse on climate change, it is the concept of uncertainty. There are uncertainties in model projections of future climate change. However, these uncertainties cut both ways, and in many cases it appears that model projections have underestimated the rate and magnitude of the climate changes resulting from our burning of fossil fuels and emission of greenhouse gases into the atmosphere. The rapid lost of Arctic sea ice is one such example. Rather than being cause for inaction, uncertainty is a reason to act all the sooner. Notes for Michael Mann: 97% of the climate models have exaggerated, not "underestimated the rate and magnitude of the climate changes resulting from our burning of fossil fuels and emission of greenhouse gases into the atmosphere." Arctic sea ice has essentially stabilized since 2007 while Antarctic sea ice is at record highs. Global sea ice is significantly above the satellite era average. The greatest cause for sorrow is the widespread inability of the public discussion to recognise the whole picture. Much of the political discourse reduces the complexities of climate change to political football (“axe the tax”); much media reporting sees only the hook to today’s passing story; many interest groups want to use climate change to proselytise for their particular get-out-of-jail free card (nuclear power, carbon farming). All of this misses or trivialises the real, systemic significance of climate change: that humankind is encountering the finitude of our planet, [the end is near] confronting the need to share and protect our endowment from nature, and realising that much will have to change to make this possible. The thing that bugs me most about the way climate change is talked about in the media is journalists citing scientific papers without providing a link to the original paper. Readers often want to get more details or simply check sources, but this is very difficult (or sometimes impossible) if the source is not given. I've raised this a few times, and get lame excuses like 'readers get frustrated when the journals are paywalled' but that's not good enough. Media should provide sources – end of. These are things I don’t see (or don’t see enough). First is still that, even though it is clear greenhouse gas emissions raise the temperature of the Earth, we’ve known this for 50+ years and no reputable atmospheric scientist in the world disputes this, most people think scientists disagree. They’ve been misled by the media, and I’ve been told repeatedly by reporters in the US and Australia that this is due to pressure from management. Second is the fact that carbon dioxide emissions are effectively irreversible and will stay in the climate system for hundreds of generations is seldom noted. [false] If we decide later that this was a huge mistake there is no going back (practically speaking). On the political side, I wish the media would note the obvious parallels of the carbon debate with past ones over restricting pollutants (mercury, lead, asbestos, CFCs), where claims that restrictions would be economically catastrophic never came true. These are things I do see that bug me. One would be phrases like “action on climate change”. We should be talking about “action on carbon dioxide” — and climate is only one reason (albeit the biggest) that too much of it is dangerous. Nothing we do with respect to any other influence on climate will prevent global warming if CO2 keeps climbing. One of the phrases that makes me cringe is when I read in the media that a particular extreme weather event "is no evidence for climate change". This is so bad it's not even wrong, but it is quite misleading. Notes for Stefan Rahmstorf: Even the IPCC SREX says a particular extreme weather event is no evidence for climate change, and there is no evidence that climate has become more variable or extreme. Climate change is a measured fact seen in rising temperatures, vanishing ice, rising sea levels etc. - it needs no further evidence. [Yes it does, namely the cause of climate change, natural or AGW] And a single extreme event cannot possibly provide such evidence, because climate change increases the number of certain extremes. Some, like heat waves, have already increased massively thanks to global warming. I can be sued for calling a public individual fraudulent but not a whole scientific community or organisation – because climate scientists and the IPCC are fraudulent. I can publish proven lies in my newspaper day after day with no penalty. I can anonymously threaten researchers online, especially the female ones. If anyone threatens me with facts, I can call them an antidemocratic, anti-jobs, McCarthyist, communist, anti-freedom, pagan environmentalist. Everyone says there is no consensus. I get annoyed when I hear yet another politician arguing that we can’t link extreme events to climate change. You know the spurious reasoning? Australia’s always had heatwaves/floods/fires, so this recent extreme is nothing to worry about. When I hear this, it’s time to turn off the TV. Climate scientists don’t just guess at what contributed to recent extremes. We methodically calculate changes in the risk of extremes due to human factors, like greenhouse gases. I don’t just get irate out of principle. I think the scale of the changes being seen now when compared to the Earth's history is something the media and the public do not appreciate. Earth's history is marked by a number of major mass extinctions of species, triggered by volcanic eruptions, asteroid impacts and release of methane from sediments. Major shifts in the state of the climate were caused either by pulsations in solar radiation or by release of carbon from the Earth. In each of these events a marked rise occurred in the concentration of greenhouse gases in the atmosphere. As the level of energy and temperature of the atmosphere increased, irreversible tipping points were reached where the synergy of feedback processes – ice melt, warming water, released methane, droughts and fires - combined to shift the climate from one state to the next. The current rise in energy of the atmosphere above that of pre-industrial times, by about 3 Watt per square meter, is about half that of the atmospheric energy rise during the last transition from glacial to interglacial state. The current shift is threatening to bring about irreversible tipping points in the climate, with the most serious consequences, likely indicated by the increase over the last 20 years or so in the intensity of extreme weather events around the globe. The current rise of atmospheric CO2 at a rate of near-three parts per million per year exceeds rates recorded in the history of the atmosphere for the last 55 million years, which retards the ability of species to adapt to environmental change in time. A consequent shift from conditions, which have allowed agriculture to take place from about 8,000 years ago, would render large parts of the continents unsuitable for cultivation. What world these people live in?